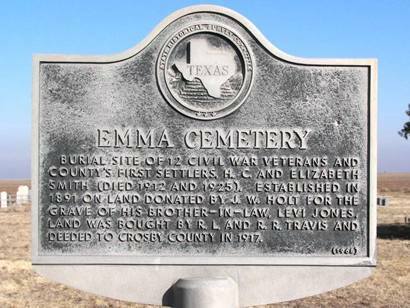 Emma, Texas ghost town, former Crosby County seat: history, cemetery, photos, vntage map & more. Emma is on that short list of ghost towns that were once county seats. 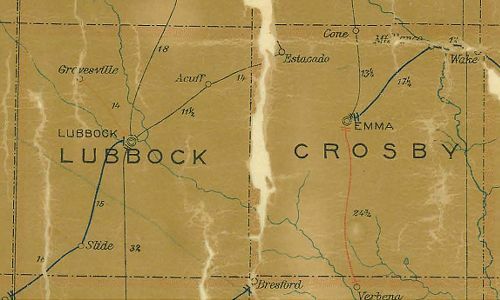 Business partners R. L. Stringfellow and H. E. Hume were store owners in the Crosby County seat of Estacado, when they bought a section of land in 1890. A post office was granted that year and the name submitted was Emma - after a woman who later married one of the partners. History doesn't seem to record if she became Mrs. Stringfellow or Mrs. Hume. 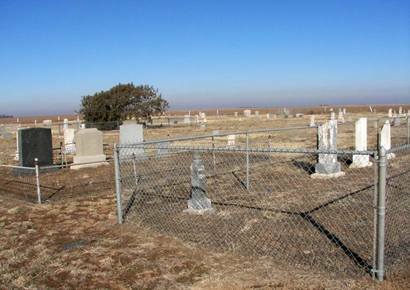 The central location made Emma a consideration for the county seat and since residents of Estacado were already drifting to the newer community, an election was held in the Fall of 1891. Emma squeaked through by a six-point margin (109-103). The residents of Estacado moved the courthouse and other prominent buildings to Emma and the town prospered for awhile. By 1910 there was a population of 800 and Emma had all essential businesses including a bank and newspaper. Emma's future seemed bright up until it was bypassed by the railroad in 1910. The shoe was now on the other foot and Emma lost out to the new town of Crosbyton in an election held in September of 1910. This election was also close (198 to 120) and soon the former townspeople of Estacado and Emma were moving again - this time in an organized exodus that consisted of steam engines, mules and most of the male population. The former courthouse was dismantled and taken to Cedric and the next year the Emma post office moved to Ralls. Today only the historical marker is left.